By using commodity wood pulp, waste paper, AOCC, OCC, LOCC and so on as raw materials, Leizhan engineer can supply customized and innovative wrapping and packaging paper stock preparation and paper making machinery solution for paper plants. Leizhan 30T/D Wrapping Paper Stock Preparation Project contains the following paper machine: D type hydrapulper, High density cleaner, Mid consistency pressure screen, Reject separator, Mid density cleaner, First stage mid consistency fine pressure screen, Low density cleaner, second stage mid consistency fine pressure screen, Double disc refiner, Inflow pressure screen, Square pulp chest agitator, pulp pump and water pump, etc. 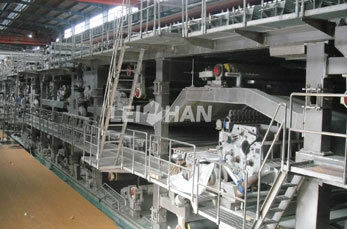 Leizhan 30T/D Wrapping Paper Machinery has a trimmed width range of 1880-5800mm and a basis weight range of 80-220g/m². It can produce 45-750t/d wrapping and packaging paper board at a speed range of 150-800m/min.